Note: This laser tagger is made from real deactivated fire gun. Buying deactivated fire guns can be illegal in your state. Production of laser tag game-sets based on the deactivated SVD sniper rifle started in mid-2012. While commercializing SVD taggers, we went to a certain risk, because this deactivated body was one of the most expensive in purchasing for tagger production. However, in this case, the end justifies the means and taggers based on deactivated guns have become very popular among regular players. The modern design of the SVD tagger has two significant changes from the previous designs. Firstly, turning it on is now made by transferring the fire switch into the firing position (previously this function was made by the button on the body). Secondly, with the electronics integration, we have tried to keep the exterior mostly authentic. Many of players who are interested in this laser tag gun are likely to remember that we have cut the body on the length of the tube. 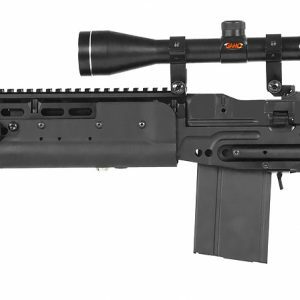 This new laser tag SVD rifle is completely made of weapon steel. Recharging is made by the bolt. 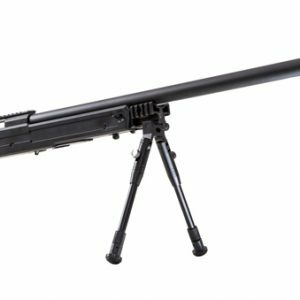 This model is equipped with lithium battery with 3 Ah capacity and has an optimum firing range of 820 feet and a maximum firing range of 1300 feet.